Sinks are often the last consideration when designing a new kitchen, however they are an incredibly important part of the design and can be an important focal piece. Whether it’s silksteel, granite, quartz, porcelain, single bowl, double bowl, surface mounted or under-mount your perfect sink is right here. Consider what you’ll be using the sink for and the items you’ll be putting in it; for instance you might want to wash your grill pan, oven shelves and trivet so you should check the size of the bowl to ensure it’s big enough. Maybe you’re also considering a waste disposal unit for the smaller bowl, again check the measurements before you make your final decision. 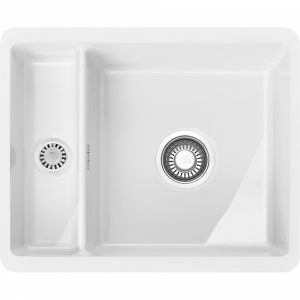 This spacious sink from Franke offers a large bowl and small bowl on the right hand side, ready for installation under a worktop. 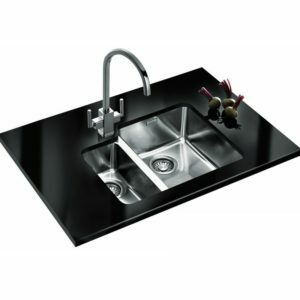 Finished in resistant silk steel, this Kubus model has a sleek and contemporary design, perfect for a modern kitchen. This handy single bowl sink from Franke is finished in Fragranite, Franke's pioneering material that is durable, with a lustre and warm to the touch. 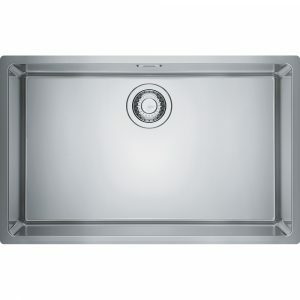 With a stylish Sterling Silver finish it is ready for undermount installation for a superb feature in your kitchen. 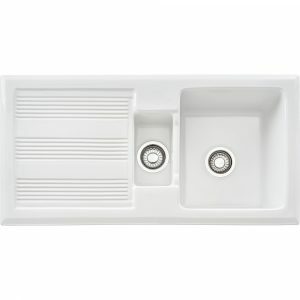 This ceramic undermount reversible sink, finished in white, is the perfect addition to a stylish kitchen. It is reversible and features one large bowl and one small bowl. 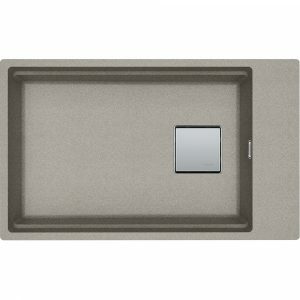 Ceramic sinks offer great durability with a more traditional appeal. The Largo range from Franke offers simple, hassle free design, ready for use in the home. Finished in silk steel, this single bowl model is hard wearing and with a long lasting appeal, suited to any style of kitchen. 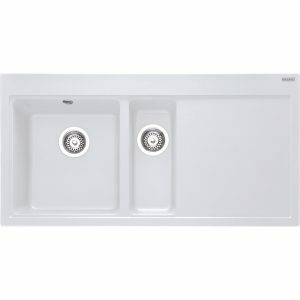 With 2 useful bowls, this Kubus model sink from Franke is great for a busy kitchen. The silk steel finish ensures that not only does it have a timeless appeal, but is durable and easy to maintain, with a hygienic overflow with hassle free cleaning. Designed for undermount installation, it will make a brilliant feature in your kitchen. 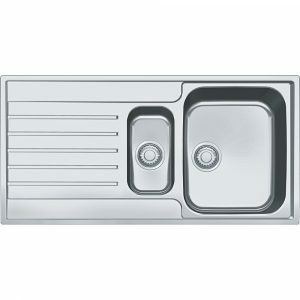 This single bowl sink from Franke is a handy addition to a kitchen. 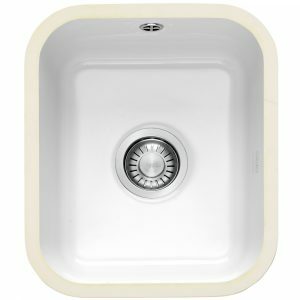 Designed to be fitted under the worktop, this sink appeals with its gloss white ceramic finish, both sleek and modern with a traditional edge. Made using Franke's pioneering Fragranite, this Mythos sink is hard wearing with a great polar white finish, creating a striking focal point in your kitchen. There's a drainer on the right hand side and a full bowl and half bowl for versatile use. 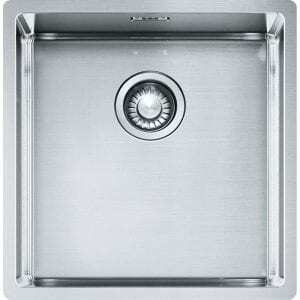 Franke's silk steel sinks not only look great, with their sleek lines and bright finish, but offer superb resistance to scratches, wear and chips. 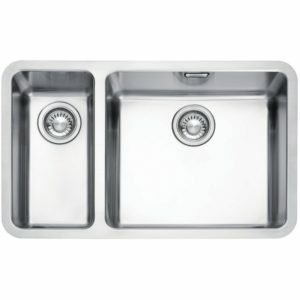 Popular thanks to their durability and appeal, this Kubus sink not only has the silk steel finish but also offers great flexibility with a large bowl and small bowl. Designed for undermount installation with the small bowl on the left hand side, this model makes a fantastic feature in your kitchen. 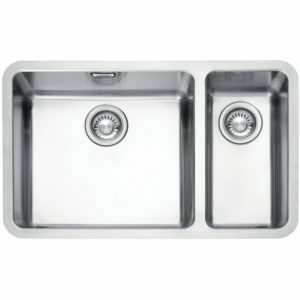 The Argos 1.5 bowl sink with reversible drainer is ideal for any kitchen. The silk steel finish is durable and hard wearing, while looking sleek and with an easy to maintain surface. The small bowl is perfect for peeling vegetables and you could even fit a waste disposal unit. 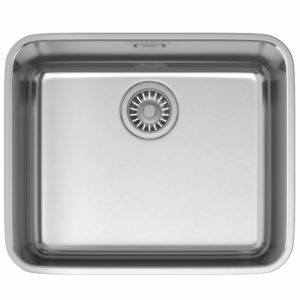 Make sure you choose the right kitchen sink for your home. How to troubleshoot and fix common problems.